Today I thought I would do a bit of a different type of post. I thought it would be good to start doing these Brand Focus post where I share with you all my favourite products from a certain brand. 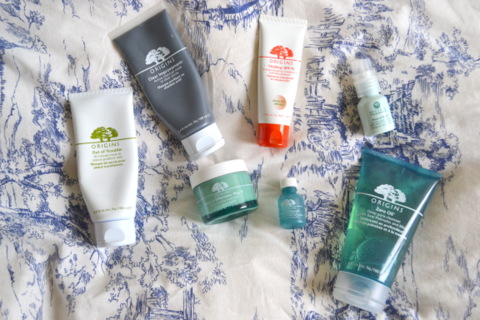 To start things off I thought I would share with you some of my favourite products from Origins, which if you've read my blog for a while you will know are one of my favourite skincare brands. First up I have face masks. One of my all time favourite face masks is the Out Of Trouble 10 Minute Mask for problem skin (review). This is a life saver when my skin is breaking out as it really helps sooth and get rid of even the most aggressive of blemishes. If my pores are feeling congested nothing beats the Clear Improvements charcoal mask, this mask is great for controlling oil, clearing up blemishes and cleaning out your pores. Basically it just ticks all the boxes and isn't drying to the skin like some clay masks. Onto moisturisers, one of my holy grail products is the Make A Difference Plus+ Rejuvenating Treatment, (review) this is a stand out product for dehydrated skin that is also combination to oily, it doesn't feel heavy on the skin yet packs in the moisture like no other. Another favourite of mine is the Vitazing SPF15 moisturiser,(review) this has a slight tint to it which wakes up dull looking skin whilst making the perfect base for makeup. The next product is pretty new to me but I had to give it a mention. It's the Zero Oil Deep Pore Cleanser, i've found this to be the perfect cleanser to use when my skin is breaking out as it really help clear up the skin quickly whilst helping with oil control at the same time. Speaking of blemishes, one of my all time favourite blemish treatments is the Super Spot Remover, (review) this gets rid of under the skin blemishes and those ones that are painful and just won't go amazingly. It can be a little drying but used correctly really does work very well. The last product is something different, it's the Sensory Memory Peace Of Mind. This is a new product to me but i've been addicted to it recently. Basically it is designed to help relax you. If you have anxiety or get headaches/stressed out after a long day you need to try this. A small amount applied on your pressure points; temples, wrist, back of the neck, really does relax you. The minty scent is perfect to use just before bed to make sure you have a restful nights sleep. So those are my favourite Origins products. I'm a big fan of the brand and I have loved almost every product I have tried by them. Feel free to share some of your favourite Origins products in the comments as well as which brand you would like me to do a brand focus on next.